Imagine this… a society that thinks it is strange to see a woman who is independent­. They think it’s odd to find a woman who won’t be shushed, who is vocal, who doesn’t define herself in relation to a man—a woman who wants to fight back against oppression. This is the fantasy world of Wonder Woman; sound familiar? Wonder Woman is ground-breaking not just because it is a female led and female directed superhero action blockbuster, but because it is a successful female led and directed superhero action blockbuster. I was so ready for this movie to be a flop. I was excited though when it looked amazing and the casting seemed to fit. Gal Gadot as Wonder Woman looks truly Amazonian strong and Chris Pine remains my favourite famous Chris (sorry Pratt, Evens and Hemsworth but I really like Into The Woods). Still, for the entire first half hour of the movie I was sceptical of every joke and every camera angle. But I can report here for you today that Wonder Woman is a good feminist superhero movie. It is a movie about power that is positioned from female viewpoint, which, it saddens me to say has not been seen before. Hollywood has woken up and realised that women dig action. It started back with Alien (1979) but Charlize Theron in Mad Max Fury Road demonstrated that we were really getting somewhere in terms of complex and exciting female action heroes on our screens. Wonder Woman is not a particularly complex character, like many superheroes her thing is Justice and that’s about it, but the fact that this movie is raking in the big cash bucks shows that men and women can enjoy this bit of not-overtly-sexualised lasso twirling fun. Want an example of what I am talking about? Let’s get our film nerd on and dissect a scene. 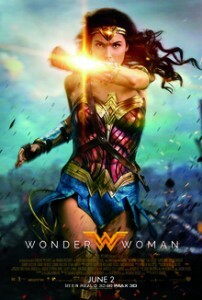 So Wonder Woman, a demigod Amazon from an island populated by women (swoon), is attempting to stop World War One and hopefully put an end to war for good. Diana Prince (AKA Wonder Woman) is in the trenches with her ragtag gang. The male soldiers are pushing past the mud and suffering of the front-line trenches. What does Diana do? She listens, she goes and has a chat with a suffering person, she’s like hey this seems bad maybe we should not ignore this and Chris Pine (AKA Steve Trevor) is all like no we must look at the bigger picture to stop the war. Then Diana is all like whatever I’m Wonder Woman and all people matter. And she goes over the trench wall! What follows is a simply amazing action sequence that gives you all the feels. Diana is in that moment the personification of taking down the patriarchy, a woman leading the charge until others rally behind her because she gets stuff done! Diana’s character can be seen throughout as using quite traditional feminine traits e.g. sympathy to motivate her actions. Amazons fight with love for justice. I was sceptical at first of creating these kind of gendered distinctions as to why Diana or an Amazon may fight as opposed to a man. However, upon reflection I think making this distinction is important because it acknowledges that it is men that start stupid wars. The change that is needed is this new kind of thinking to put an end to suffering. Diana is a warrior and shown to be a powerful physical force. She is still scantily clad but this is a functional warriors outfit (plus the film is true to the original comics otherwise I would be preaching for a less overtly beautiful Wonder Woman but one step at a time). This film is not perfect however. I read an excellent article by appearance activist Carly Findlay about the vilification of scarred faces, looking at Dr Poison in Wonder Woman. As someone in the comment section rightly pointed out, heroes can be scarred for example Deadpool is scared all over his body. BUT in the world of Wonder Woman seeing a traditionally beautiful woman against someone with facial scarring obviously creates an uncomfortable binary between what is good and what is evil. There is also this one theme in the film that continues to irk me. Steve Trevor is discovered by Diana when his plane accidentally crashes into the ocean of her home island. Diana saves him and brings him to the beach to recover. Fine, fair enough, nothing majorly scandalous happening there. BUT a fair amount of time after this the pair fall in love. Which is also fine; their relationship is pretty cute and thankfully Diana is not projected as some kind of virgin who needs saving. She sees men as interesting but largely because she has never seen one before so there is a kind of innocent dynamic there potentially but it is not a virginal innocence. What irks me is that Diana is coupled with the first ever man she sees which instantly reminds me of a fairy tale. Stripping away the details it looks like the Little Mermaid falling for Eric (she even saves him from drowning). I suppose I wanted Diana to be a strong independent lady and not have a romantic storyline. Maybe I am asking too much of Hollywood and the romance is their way of traditionalising an otherwise new-ish story. Maybe this will be the first dip for some viewers into easily digestible feminism. This film is still a superhero film—people love these kinds of movies and will continue to love them as long as they stay fresh and contemporary and be just a bit of fun. I don’t need a special female version of an action film to make it accessible. Women have been watching action for ages. I was however hoping for something different and a new motivation and a new angle for the genre and that is what I got. And it seems like other people were feeling the same way, hence the film’s success. I hope that in ten years a movie like this is exciting but no longer new and especially no longer controversial.